This week, the Rotterdam Academy of Architecture organized a double lecture on shopping streets, the most common urban space for human interaction, including conflict, and how designers and planners can make a difference here. The lecture ticket included a tasty hotdog from the trolley parked in front of the entrance. The sociological view on shopping streets – by Sharon Zukin – focused on narratives, migration and problems of gentrification, whereas the planners perspective – by Mark Brearley – showed the importance of shopping streets in the metropolis and several examples of renovation projects to give them new life. Although both agree on the vital function of diverse shopping streets in the city, the first sees renovation as a possible threat, the latter as a sollution. First, Zukin discussed her research on ‘Global Cities, Local Shops’. Due to the snow blizzards in New York that day, her plane remained on the ground and Zukin gave her lecture through a (rather good) skype connection. The project included cases of shopping streets in New York, Toronto, Amsterdam, Berlin, Shanghai and Tokyo. 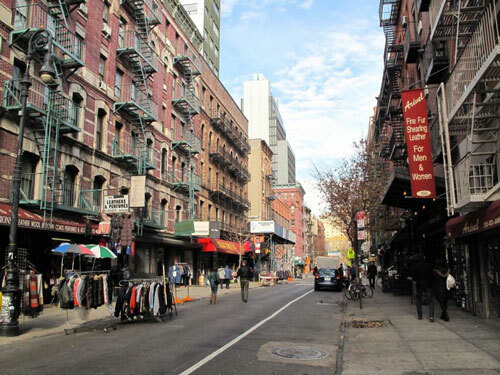 Examples of Orchard street (New York) and Javastraat (Amsterdam) show that shopping streets are not only spaces of economic transaction, but also provide visual inside-outside relationships and signs of local and global culture. Actually, the same shops and visual styles of the Global North and Global South can be found in both streets! Often, different ethnic groups are found in the same places in different periods, until the ABC (art gallery, boutique and coffee) arrive, and gentrification and renovation start. Zukin believes that only with delicate urban policies a mixture can be maintained in transforming shopping streets. The most important threats to these ‘fragile social eco-systems’ are: lack of capital of small businesses and their need to attract customers, conflicts on rents between store owners and building owners, competition with online shops and the vulnerability regarding urban regeneration policies. In an extraordinary example in Shanghai, she demonstrates that even preservation of the local buildings and population is not always enough to avoid gentrification. A local business man took the opportunity of a real estate crisis in Shanghai to avoid demolition of the historic neighborhood and start a slow transformation process with the owners themselves. Nowadays, they live upstairs, while they rent out the ground floor to art galleries and expensive stores, hereby changing the entire streetscape. Brearly, who led the metropolitan design team of the Mayor of London for over a decade, shed light on ‘Affecting Streets’. His design team was installed by London’s first elected mayor Ken Livingstone with architect Richard Rogers, continued from that point under different names until it was recently dismantled under Boris Johnson. 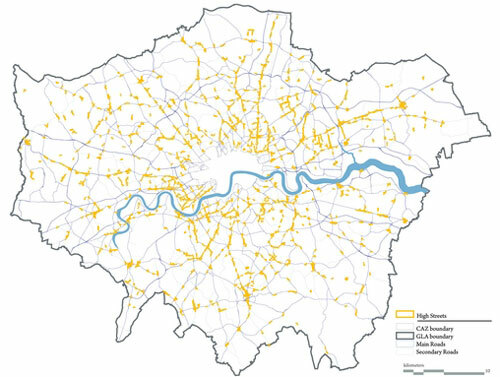 Besides the High Street project, the presentation also revisited the Crossrail project, the London Green Grid and the choice of London for a compact city development with a green belt. Brearly’s tone was so dry that I suppose one could call him the Rowan Atkinson of town planning. London has 600 High Streets, where many of the city’s commercial functions and jobs are located. London is also supposed to have 600 boroughs or ‘localities’, but that could be a coincidence. One example of a very long high street includes the same amount of workers as does Canary Wharf. Many streets and squares have been nicely refurbished in recent years, including some of the places affected by the riots. In fact, the high street model may continue to thrive in the future. The recent attention for high streets was propelled by massive shop vacancy problems. London, however, will still grow in the future by about a third. Brearly therefore believes it would be a good idea to extend the high street network of the city by a third as well. This entry was posted in Architecture, English, Heritage, Incubators, Urbanism and tagged high street, London, Mark Brearly, New York, Sharon Zukin, shopping street by Merten. Bookmark the permalink.